Tired of filling up your iPad’s 64GB internal storage space? Your prayers are answered thanks to the new HyperDrive from HyperMac. This device will help you break the limited space barrier on your iPad. The Hyperdrive can give you as much as 750GB of added space on top of the 64GB the iPad carries depending on your version of the device. Hyperdrive does this by connecting to the iPad via the Apple’s camera connection kit. 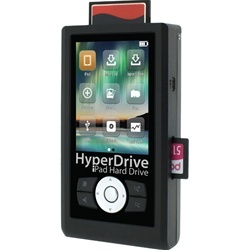 HyperDrive does more than just give you more space but can also accommodate 12 different memory cards via its built-in memory card reader. It also has a 3.2 inch display and navigation buttons to manage data. The device supports 2.5 inch SATA hard drives with no capacity limit, meaning that the disk space can go much more beyond 750GB. The device is available for $249 without the hard drive and for the 750GB which is the maximum capacity offer end; will cost you $599.